The Certify-Able Data Professional: DAMA-DMBOK is heading to the presses! 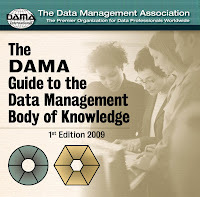 The long-awaited Guide to the Data Management Body of Knowledge went to the publisher on January 22, 2009. The plan is to launch it at Enterprise Data World in Tampa, April 5-9. The guide will be published by Technic Publications (Steve Hoberman's company), and will be priced at $54.95 U.S. currency, according to Deborah Henderson, the V.P. of Education for DAMA International. She also suggests that it be purchased in conjunction with the DAMA Dictionary of Data Management, which is $44.95 and currently available at Amazon.com. This is a landmark publication for the data management profession. Over 150 experts in the field contributed to authoring, reviewing and editing this comprehensive guide. It will be a valuable resource for those preparing for certification and will serve as a framework for future certification exams and curriculum. Look for it at Enterprise Data World in April, and it will be available for pre-sale at Amazon.com soon. Stay tuned to this blog! As soon as it's available on Amazon, you'll find a link right here.